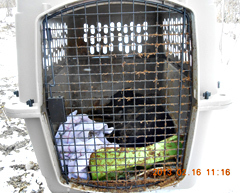 A reward is being offered for information on the person who left this dog to die in its crate in Waterloo. Officials in Waterloo are hoping a large reward fund will lead to an arrest in a disturbing animal cruelty case. Waterloo Animal Control officer Maria Tiller is trying to find the owner of a dog found dead inside a kennel that was left along a gravel road. An online campaign has raised a reward for information leading to a conviction of the person responsible. “The last I heard, (the reward fund) was up to $1,200 and growing,” Tiller said. The dog carcass and crate were discovered at 8:15 a.m. Saturday by a city employee. Tiller said the dog was covered in feces and urine and had likely starved to death inside the crate. The crate was abandoned on the gravel road on the east side of Waterloo sometime either late Friday night or early Saturday. Tiller has received a lot of phone calls since the discovery. “I do have two fairly good leads that I’m following up on,” Tiller said. Anyone with information about the case is asked to call Waterloo Animal Control at 319-291-4440.